Examples, solutions, and videos to help Grade 1 students learn how to practice to visualize and solve doubles and doubles plus 1 with 5-group cards. 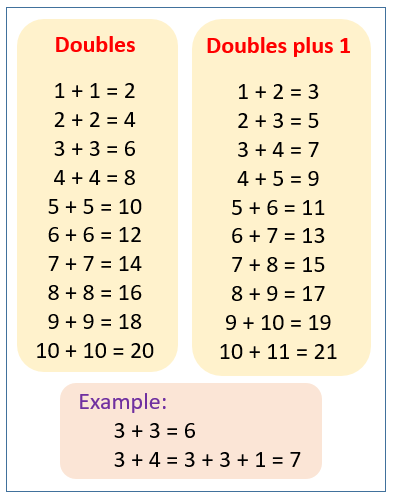 What is Double Plus 1? Double Plus 1 is an addition strategy. When one addend is one more than the other addend, we double the smaller addend and add one to get the answer. The double plus one strategy requires you to know how to double a number mentally and then add one. Scroll down the page for Doubles plus 1 worksheet, lessons, and a song to help you learn the Doubles. The following figure gives the Doubles and Doubles Plus One. Scroll down the page for more examples and solutions. 1. Draw the 5-group card to show a double. Write the number sentence to match the cards. 2. Fill in the 5-group cards in order from least to greatest, double the number, and write the number sentences. 4. Match the top cards to the bottom cards to show doubles plus 1. How to use the doubles plus 1 addition strategy?